Visual impairment is among the top 10 causes of disability in the US and it’s one of the fastest growing. While there are currently six million Americans aged 40 or over suffering from visual impairment, either low vision or fullon blindness, studies estimate this figure to double by 2040 as a result of rising diabetes cases and other chronic diseases that also affect vision, as well as aging population. Cybernetic vision – electronic vision implants connected to the brain – is but one of the myriad of high tech solution being discussed at the moment which aims not only to help the visual impaired navigate their surroundings, but regain sight to almost full degree. Until this happens, however, we might be better off discussing more practical solutions. The walking cane has helped the blind navigate obstacles for thousands of years, and its design has remained largely unchanged since – a sophisticated stick. What looks like a combination between a TV remote and a Star Trek tricorder, the Enactive Torch aims to help all the aging baby boomers, injured veterans, diabetics and white-cane-wielding pedestrians navigate their surroundings using 21st century tech. 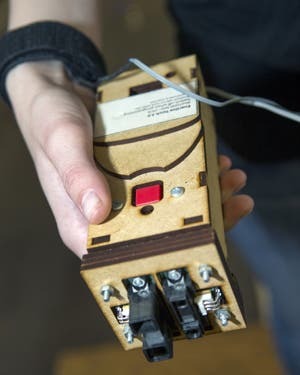 The device developed at University of Cincinnati is fitted with infrared sensors that estimate how far and how large obstacles are, conveying this information via vibrations to an attached wristband. The vibrations are subtle or more intense depending how close the obstacles are. This allows the user to make decisions on how to move about using a virtual touch as a guide. “Results of this experiment point in the direction of different kinds of tools or sensory augmentation devices that could help people who have visual impairment or other sorts of perceptual deficiencies. This could start a research program that could help people like that,” says Luis Favela, a graduate student in philosophy and psychology. UC’s Luis Favela explains a task to Mary Jean Amon during a demonstration of Favela’s research experiment in the Perceptual-Motor Dynamics Lab. 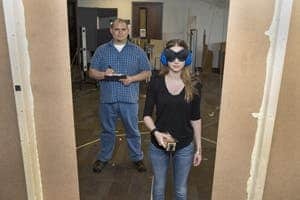 For their experiment, 27 undergraduate students with normal or corrected-vision were asked to judge how well they would be able to pass through an opening just a few feet in front of them without shifting their normal posture. This assessment was made in three distinct situations: only using their vision, using a cane while blindfolded and using Enactive Torch when blindfolded. The whole idea was to see how judgments differ when these are made under the influence of vision or the Enactive Torch. Most surprisingly, all three judgements were equally accurate. So, does this mean that the Enactive Torch is useless? Judging from these results alone would give the device far too less credit than it deserves. The findings suggest that wielding a cane blindfolded will help you navigate your surroundings just as well as you would using a pair of healthy eyes. False. Try doing that on stairs, traffic, unfamiliar places with varied obstacles. Some more thorough examinations and experiments would have been much more helpful. The results were presented at the American Psychological Association’s (APA) annual convention, held Aug. 7-10 in Washington, D.C.